This clever psychological thriller will have you on the edge of your seat. Read an extract from A Nearly Normal Family and pre-order now. 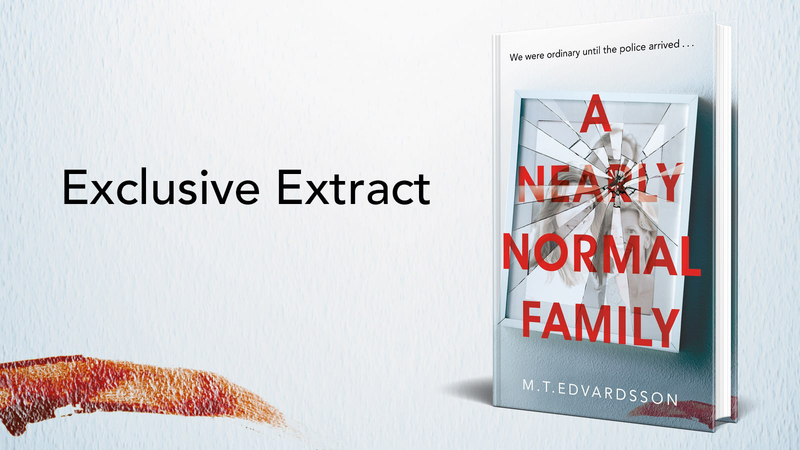 A Nearly Normal Family by M. T. Edvardsson is a riveting psychological thriller which asks the question, how far would you go to protect your child? Read this gripping extract from book and pre-order A Nearly Normal Family here. We were a perfectly ordinary family. We had interesting, well- paid jobs and an extensive circle of friends. We kept active in our free time thanks to our interest in sports and culture. On Fridays we ate takeout in front of Idol and dozed off on the sofa before the voting was over. On Saturdays we ate lunch downtown or at a shopping center. We watched handball or went to the movies; we enjoyed a bottle of wine with good friends. We fell asleep each night cuddled close together. Sundays were spent in the forest or at a museum, having long talks on the phone with our parents, or curled up on the sofa with a novel. We often rounded off Sunday evenings sitting up in bed with papers, binders, and computers strewn everywhere, preparing for the upcoming workweek. On Monday nights, my wife went to yoga and on Thursdays I played tennis. We had a mortgage, which we dutifully made payments on; we sorted our trash and used our blinkers and kept to the speed limit and always returned library books on time. This year we took vacation late: early July to mid- August. After several lovely summers in Italy, we had spent the last few years scheduling our international trips in the wintertime so we could spend summers relaxing at home and going on shorter excursions along the coast to visit friends and relatives. This time we also rented a cottage on the island of Orust. Stella spent just about her whole summer working at H&M. She was saving up for a long trip to Asia this winter. I still hope she manages to go. You could say that Ulrika and I rediscovered each other this summer. It sounds like such a cliché, almost too cheesy; no one believes it’s possible to fall in love with your wife all over again after twenty years. As if the years raising a child were merely an aside in our love story. As if this is what we’ve been waiting for. But that’s how it feels, anyway. Kids are a full-time job. When they’re babies you’re waiting for them to become in de pen dent, and you spend all your time worrying that they’ll choke on something or fall on their face. Then comes preschool and you worry because they’re out of your sight, because they might fall off a swing set or fail their next check-up. Then they start school and you worry that they won’t fit in, won’t make any friends, and everything is homework and riding lessons, handball and pajama parties. They start high school and there are even more friends, parties and conflicts, talks with tutors, all the chauffeuring around. You worry about drugs and drinking, that they’ll end up in bad company, and the teenage years go by like a soap opera at 190 kilometers per hour. Then suddenly you’re standing there with an adult child and you think you’ll finally get to stop worrying. This summer, at least, we managed several long runs without worrying about Stella. Family life had never seemed so harmonious. Then everything changed. What do you think, would not one tiny crime be wiped out by thousands of good deeds? He knew that henceforth, all his days would resemble one another, and bring him equal suffering. And he saw the weeks, months, and years gloomily and implacably waiting for him, coming one after the other to fall upon him and gradually smother him. The worst part about this cell isn’t the rock- hard bed you can hardly flip over in. It’s not the dim light. It’s not even the disgusting rings of old piss in the toilet. The worst part is the smell. I have to confess that I was one of those people who thought the Swedish correctional system was a straight-up chain of decent hotels. That it was hardly punishment to be locked up in this country. I believed it was more or less like an after-school program where you could just chill, lie in bed and binge TV series, get fed pretty good stuff, and not have to care about anything. I said in school one time that I didn’t understand why there were homeless people in Sweden, and that I would much rather be in prison than live on the street. After six weeks in jail I will never again say I want to be locked up, or that I think it’s like a hotel. My room is under one hundred square feet. They call it a room because cell sounds more depressing. One hundred square feet is like the size of a horse’s stall. It’s smaller than most Swedish backyard green houses. It has a bed, a desk, a chair and a shelf, a toilet and a sink. I don’t want anyone to feel sorry for me. I’m in here for a reason, and I’m not a victim. I ache all over, I’ve lost weight, and my thoughts plague me like tinnitus. But there’s no reason to pity me. Hell no. Back in middle school I had a favorite expression that I used all the time, and it feels more fitting than ever these days: Don’t play with fire if you can’t handle the heat. There is no such thing as justice—in or out of court. Main proceedings are called to order in Courtroom 2. Outside the windows, the snow is falling in large diamond flakes and every time the door to the court house opens, a chill sweeps through the building, making the hair on my arms stand straight up. When I enter the courtroom, district court judge Göran Leijon meets my gaze and nods grimly. We have met on several occasions throughout the years, and I have never had reason to be dissatisfied. Leijon is not just a competent judge. He is also sharp and nuanced, a courteous person with great integrity. but anxiety in me now. The room, the air, the walls, the faces — they all seem threatening and make me dizzy. The past several days are a blur. Places and moments crisscross in my mind like brambly patterns. Impressions flash by here and there, all out of order in time and space. It’s like walking around in an endless, foggy dream. I was just in a meeting with a client in Stockholm. I no longer have any notion of what was said or why I was there. I know I dozed off on the plane home. A flight attendant asked if I was feeling okay. I can still see her worried face. I was so recently at the height of my career, with a bounce in my step, clad in Dolce & Gabbana from head to toe, admired for my straightforward manner, my skill, my industriousness. Now I’m sitting in a courtroom and awaiting the proceedings that will determine my daughter’s future, the future of myself and my family. Until so recently, we were a perfectly ordinary family. Now we are prisoners under a merciless spotlight. There before me, Presiding Judge Göran Leijon whispers something to the lay judges. Two of them are women in their seventies, one from the Green Party, one Social Democrat— rather typical lay judges. By all appearances they are empathetic women who bring to the court great understanding of how socioeconomic factors may influence criminal acts. The type of lay judges I have myself encountered in hundreds of cases, and who, nine times out of ten, mean good news for me and my client. In this particular matter, however, I’m not entirely convinced that the effect will be positive, a worry I have brought up with Michael. Partly this is because Stella is a woman; partly it’s because her appearance will work against her. What’s more, she must in every respect be considered a member of the white upper middle class. To make matters worse, she has a tendency to refuse, under any circumstances, to live up to the norms of how a well-brought-up young lady is expected to present herself. With any luck, Michael has helped her come to understand what a crucial role her courtroom behavior might play. I feel more confident about the third lay judge. He is a man in his forties, retired on disability, a Sweden Democrat— according to Michael he seldom shows any great interest in the legal process. It is often not worth expending too much worry on the lay judges. In reality, their role in the courtroom can be considered window dressing. No one gives much weight to their opinions, and should they have the poor taste to disagree with the presiding judge’s decision, he will squash them flat without batting an eye. In that aspect I can rely one hundred percent on Göran Leijon. Then the door on the far end of the room opens and each head in the gallery swivels. Everything stops. The open door gapes before me. It feels as if I am caught in a narrow tunnel. I twist my body, squirming and trying to breathe normally. First, a uniformed security guard appears in the doorway. He turns around and says something. My vision is limited and blurry and the tunnel keeps closing in around me. At last I see Stella. Tears squeeze from my eyes, further clouding my vision. She is so small, and everything hurts so frightfully much. It feels like just yesterday that she fit on my lap, when she would sit with me to be petted like a doll. Her pacifier and security blanket, the first time she stood up and ran. Stella neither crawled nor walked—s he ran right away. I remember chickenpox and scraped knees, strawberry stains on her summer dress, her freckles, and how I fell asleep in her bed night after night with a book on my face. I think about all her dreams. She wanted to change the world. What could otherwise be the point of living? At first she wanted to become a pastor like her father, and later a police officer or fireman. She was so enraged that people said fireman — she was going to become the first firegirl. Are there any dreams left? As I watch her being led into the courtroom it all becomes so clear, like a blow to the face. My failure is as thorough as it is unforgivable. Stella is eighteen years old and all her dreams have been crushed. She has always wanted to help people. She was going to see the world, swim with sharks, climb mountains, learn to dive and fly, go skydiving, and ride a motorcycle across the United States. For a while she dreamed of becoming an actor or a psychologist. What is a human being without dreams? Our gazes meet for the briefest of moments before she sits down next to Michael. Her eyes are tired and empty; her hair is lank, her skin full of spots. She is still a frightened little girl. My frightened little girl. And I rise slightly from my seat, balancing on my toes and stretching out my arm. To fail to be there for your child. There is no greater betrayal.